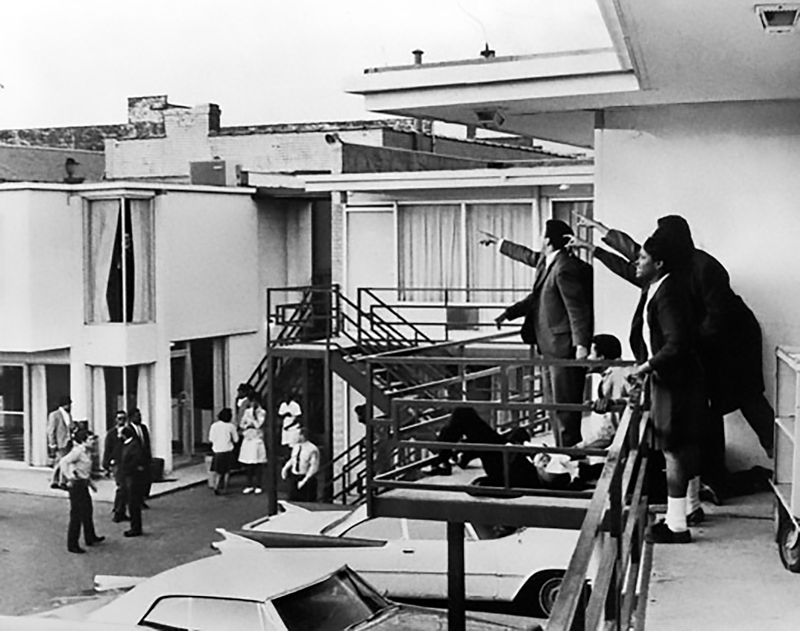 On April 4, 1968, James Earl Ray shot Martin Luther King while he was standing on a balcony of the Lorraine Hotel in Memphis, TN. The ensuing manhunt would last more than two months and span five countries. 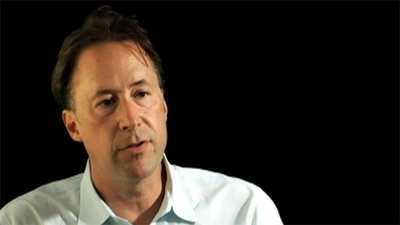 It was said to be the FBI's most expensive and ambitious investigation in history. 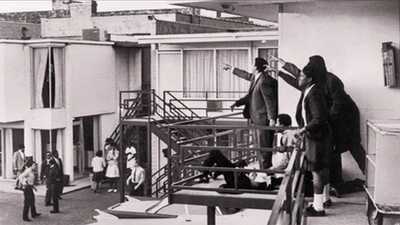 Seconds after Martin Luther King was shot at the Lorraine Hotel in Memphis, TN, friends and advisors point to the area where the shot originated. 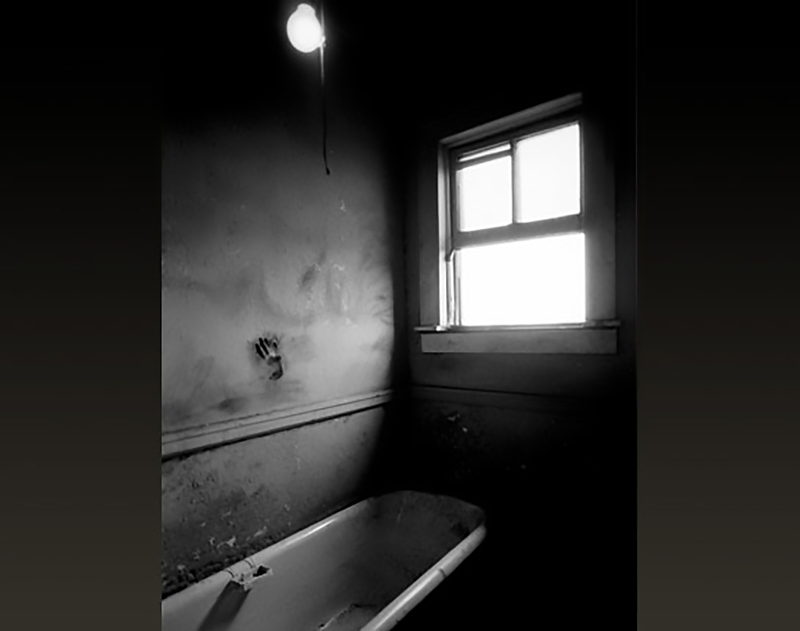 James Earl Ray had stood in the bathtub of a shared bathroom in Bessie Brewer's Rooming House, and balanced the rifle on the window ledge when he shot Martin Luther King. 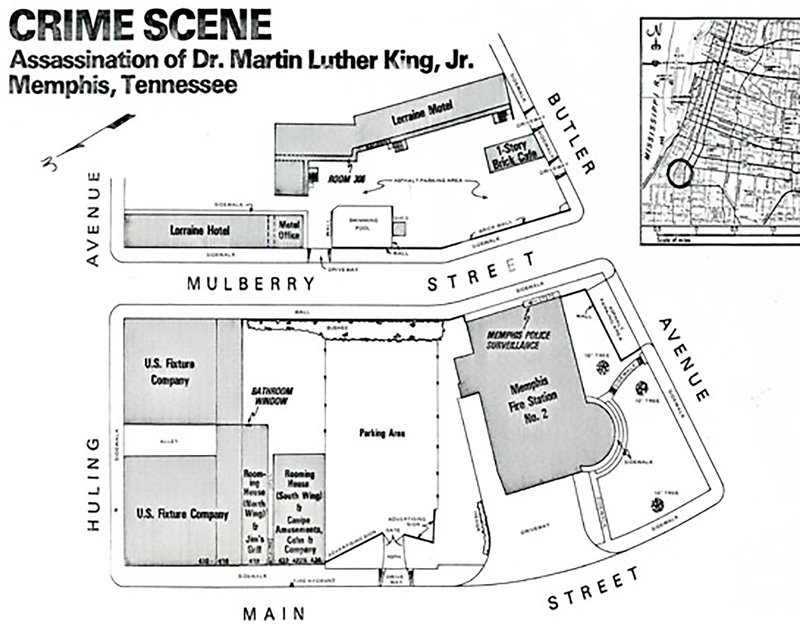 A crime scene diagram of the area shows a clear line of sight between the Rooming House bathroom (bottom left) and the balcony of the Lorraine Motel (top right). 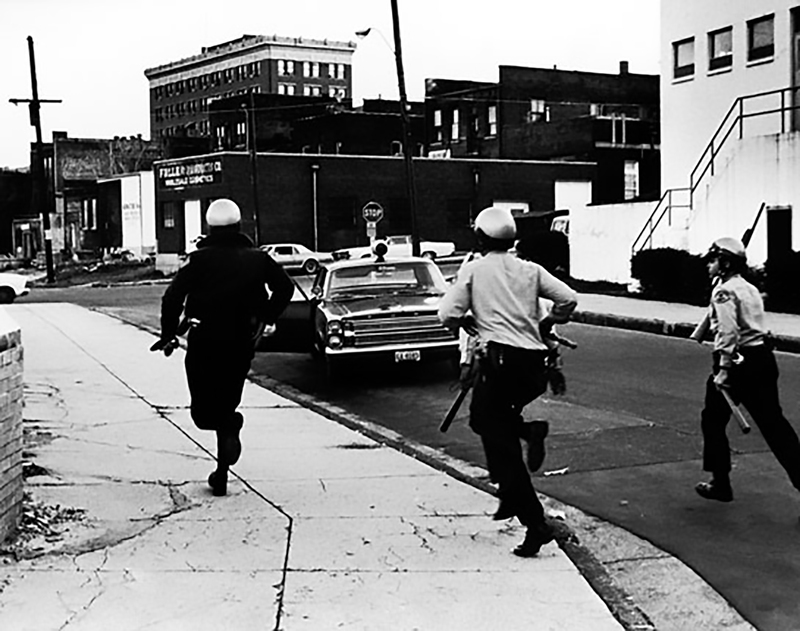 Seconds after the shooting dozens of police raced towards the Lorraine Motel. Police had been on high alert during King's stay, and ten patrol units were nearby King's motel when he was shot. 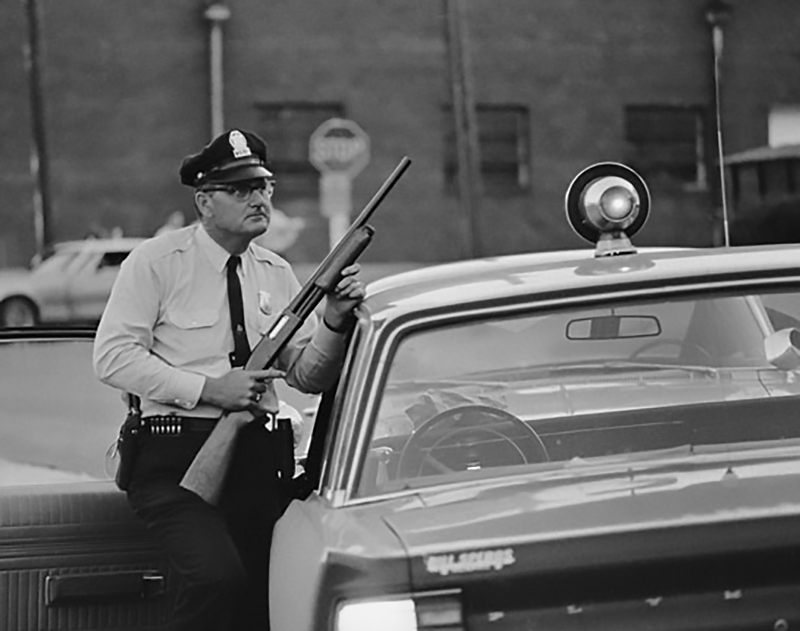 When Ray exited the Rooming House, he saw a parked police car in the distance (left) and panicked. He dropped a bundle he was carrying in front of the Canipe Amusement Company. 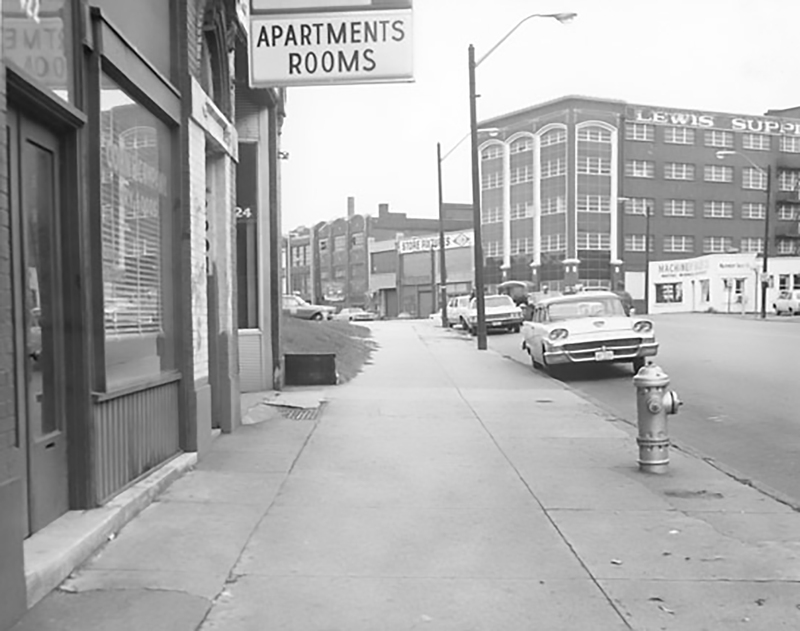 Within four minutes of the shooting, Memphis police had established a perimeter around both the Lorraine Motel and Bessie Brewer's. Unknown to police, Ray had already fled the area. Police find the bundle that Ray had abandoned. 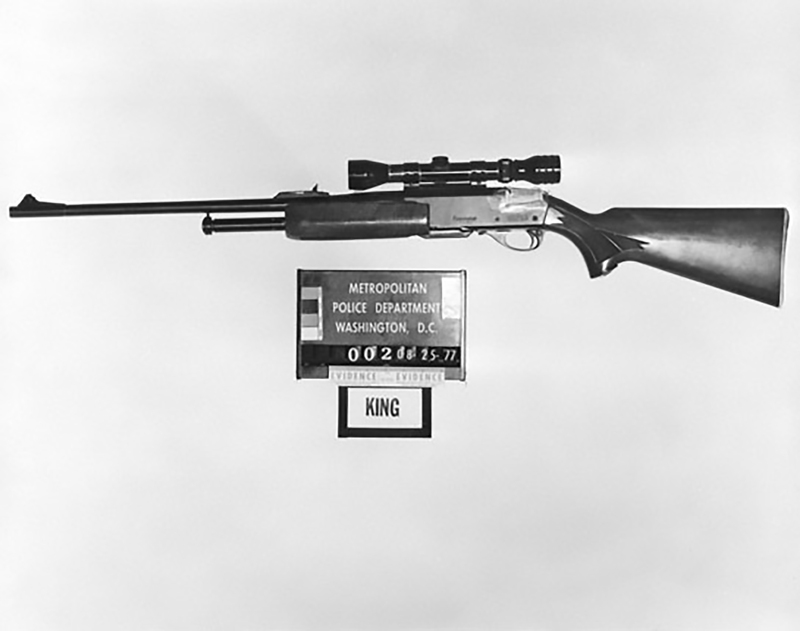 A rifle juts out from under a blanket. The assassination rifle was a Remington Gamemester 30.06. 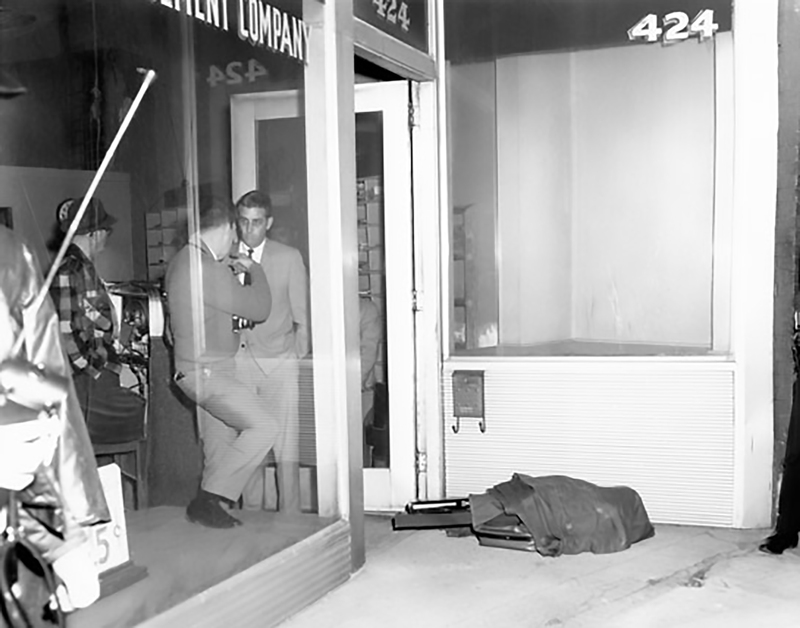 Upon investigation, police would discover that a Harvey Lowmeyer purchased the gun in Birmingham, AL on March 30, only five days before the shooting. 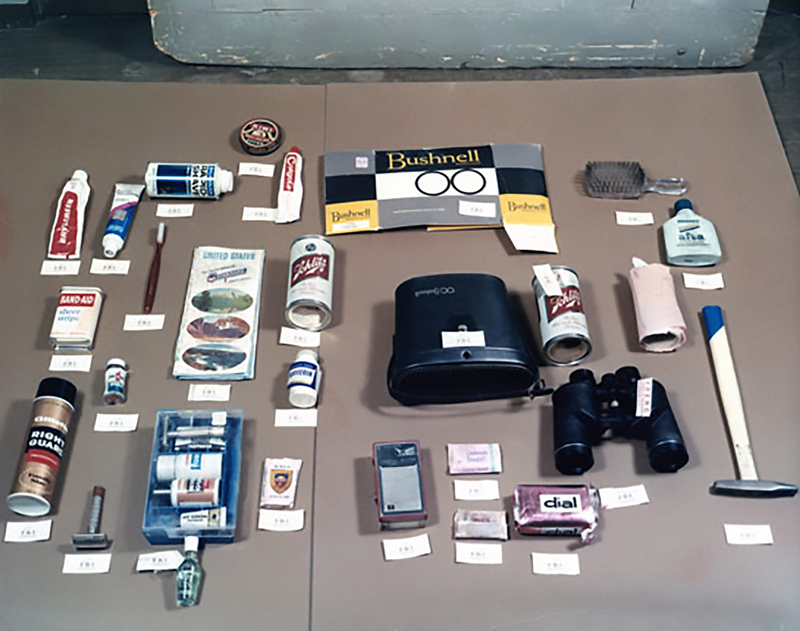 Other contents from Ray's dropped bundle include toiletries, some beer cans, and binoculars. Police discovered that the binoculars had been purchased locally only a few hours earlier. 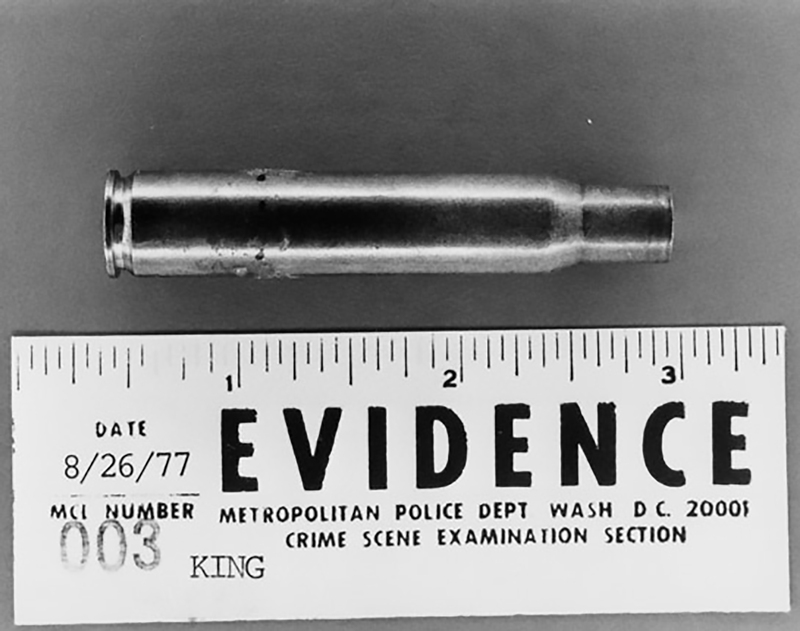 In the Rooming House police discovered an empty bullet cartridge, later proved to be from the bullet that killed Dr. King. Shorts and a tee-shirt were found in a Boarding House room registered to a John Willard. 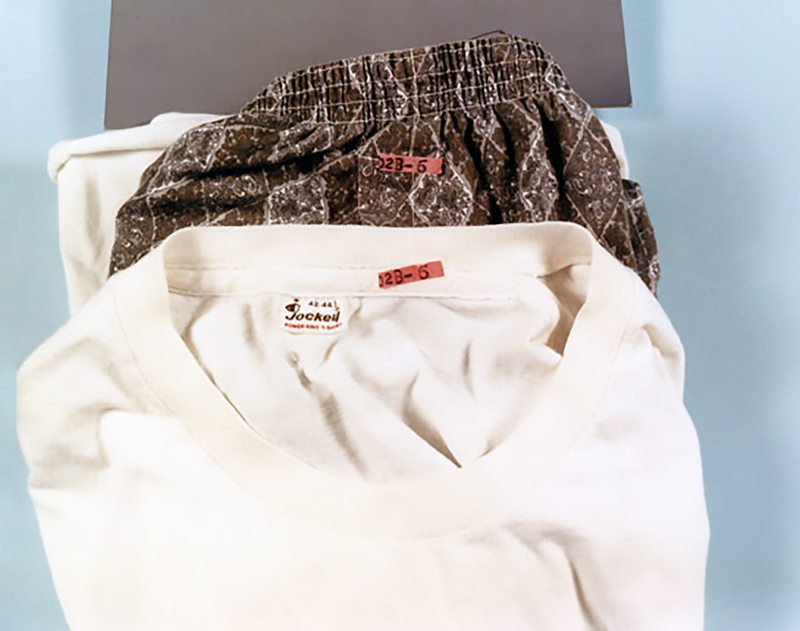 Investigators traced tags on the clothing to an LA laundry service, where they discovered a receipt in the name of Eric S. Galt. Police also found the Commercial Appeal story revealing King's location at the Lorraine, and a radio. 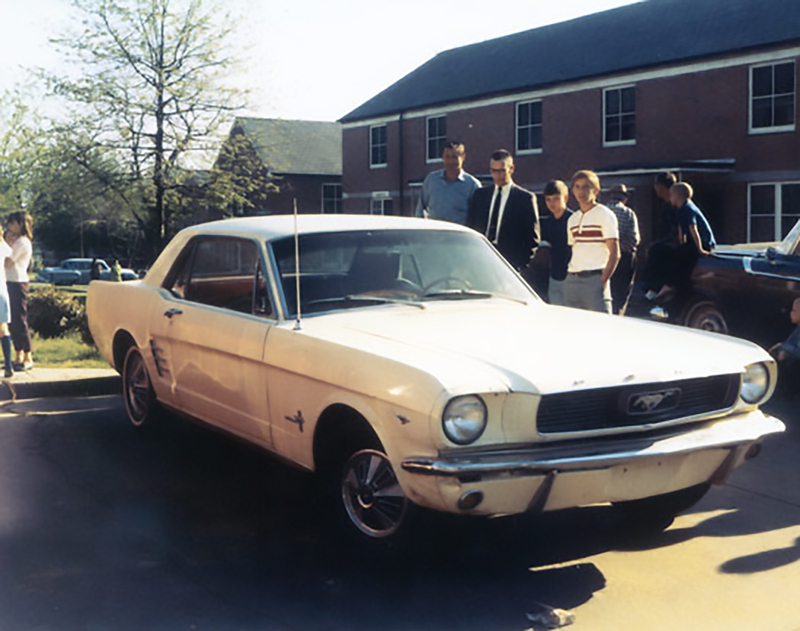 In Atlanta, police locate the white Mustang Ray had used to flee Memphis. After wiping it clean of fingerprints, Ray abandoned it in an Atlanta parking lot. Police discover the car is registered to Eric Galt. 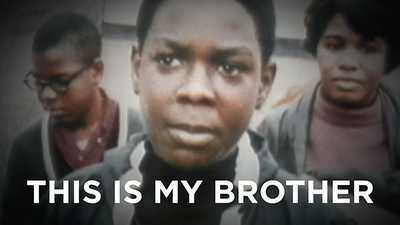 Through leads in Birmingham, AL and Los Angeles, CA, police find the first photo of "Eric S. Galt". 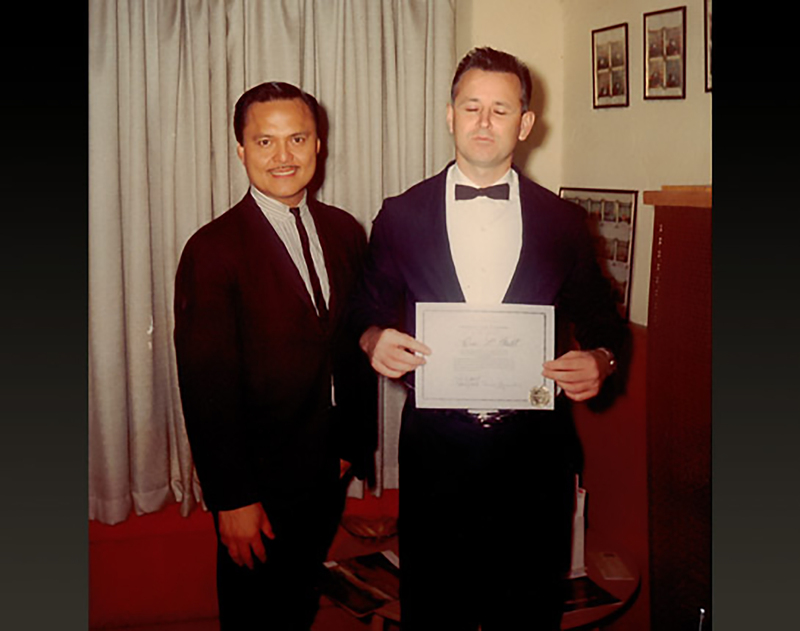 This picture was crucial in connecting the name "Eric Galt" to the identity of James Earl Ray. 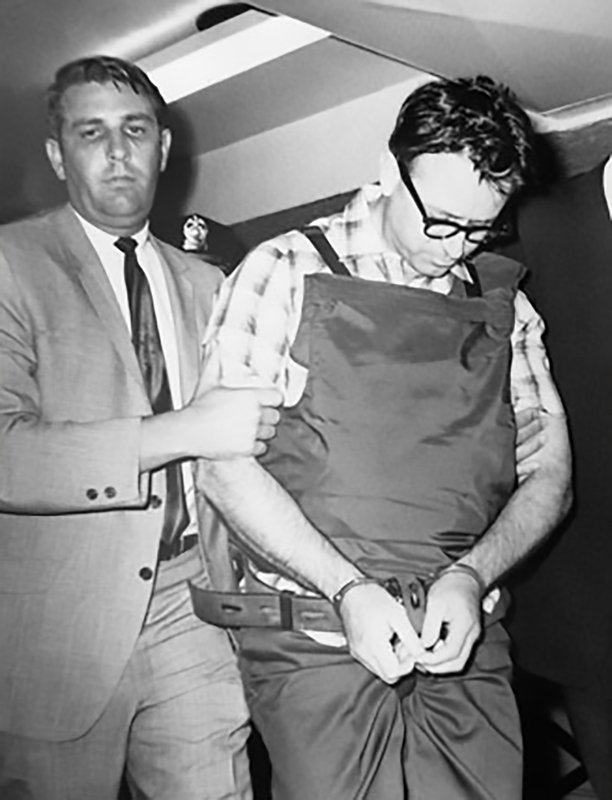 By comparing fingerprints found in the Rooming House to known fugitives, the FBI finds a match with James Earl Ray. 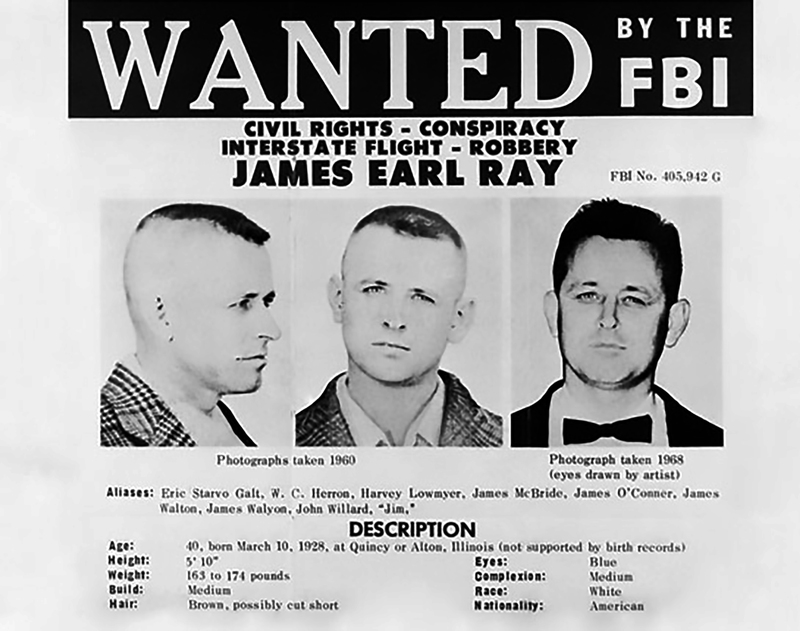 The Wanted poster includes Ray's mug shots from his 1960 incarceration at Jefferson City, MI and the photograph of Ray as Eric Galt. The poster includes Ray's aliases, including Eric S. Galt, Harvey Lowmeyer, and John Willard. As George Sneyd, Ray receives a Canadian passport. With this, he is able to purchase a roundtrip ticket from Toronto to London, and he soon leaves the country. 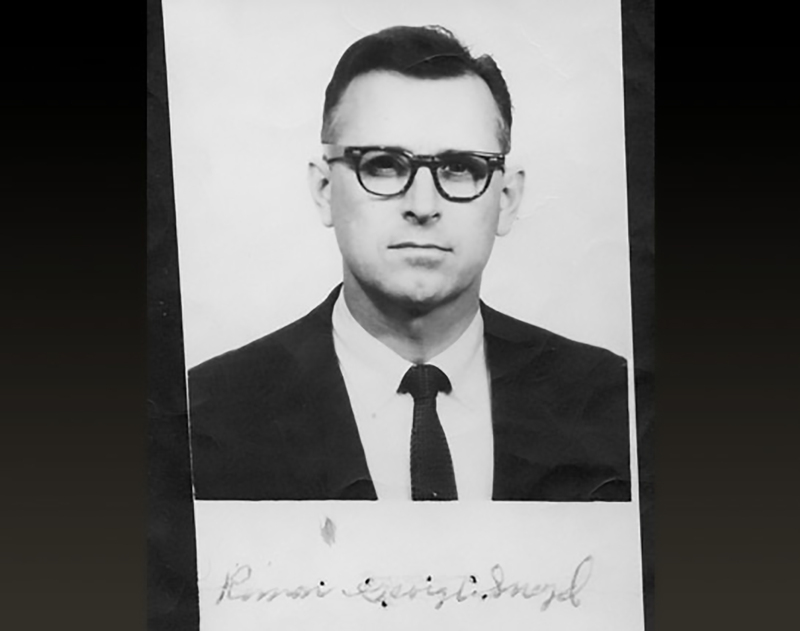 Hot on Ray's trail, the FBI catches up to him in London and extradites him to the United States on July 19, more than three months after the assassination. Ray arrives in Memphis in a belted straight jacket and leg shackles.